It is no surprise that the future Hall-of-Famer Kobe Bryant was the leader of all back-court players with 723,031 votes overall for the second round of fan voting for the 2014 NBA All-Star Game. Note that Mamba has only laced up for a mere six games this season from a recovering Achilles tear and a more recent knee injury. There’s no secret that the fans love him on the court and with the announcement of the Kobe 9 and the Kobe Prelude Pack last month, they love him off of the court as well. 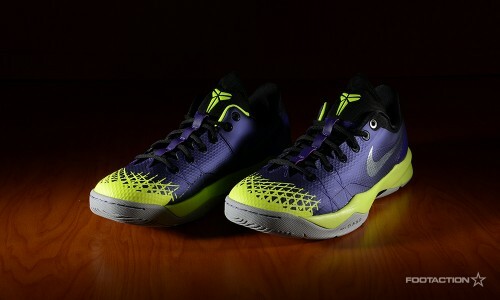 The Nike Kobe Venomenon in Court Purple, Volt and Wolf Grey burst onto the scene. The “Glow In The Dark” colorway was a delight to audiences from initial reactions and this sneaker is sure to have the same effect. Further than a clean colorway that meshes with Los Angeles Lakers attire, the design features of Nike performance technoloogy include Zoom cushioning, Hyperfuse and Flywire construction. Releases online only on Saturday. Print article This entry was posted by hhcblog on January 4, 2014 at 12:01 am, and is filed under Footwear. Follow any responses to this post through RSS 2.0. You can leave a response or trackback from your own site.